As all 12 Louisiana college teams are currently participating in spring practices, that could mean only one thing and that is the upcoming college football season is approaching near. As we continue to wait the days before fall practice, for the next three weeks, we will recap the National Signing Classes for all 12 Louisiana collegiate football teams. 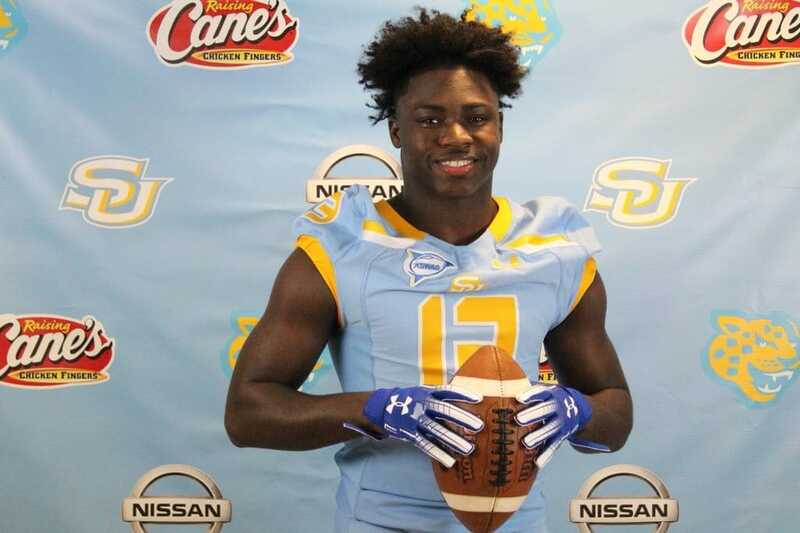 Today, we will recap the National Signing Class for the Southern University Jaguars. The Jaguars are coming off a great season. 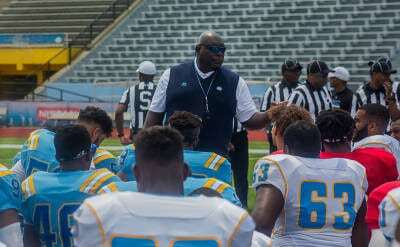 Not only did the Jaguars post a winning 7-4 record, but they also defeated rival Grambling State in the annual Bayou Classic, and by doing so, played for the right to play in the SWAC Championship game. Even though the Jaguars ultimately fell in that game losing to Alcorn State, this is still a fresh sight for the Jaguars fans as the team clinched its first SWAC West title since 2014. Now, for Head Coach Dawson Odums and the Jaguars to continue on their recent success, they must get good production from not only its veterans, but also the talented incoming high school signees and college transfers that are coming into the program. Louisiana Football Magazine’s recruiting expert Lee Brecheen has watched all of the Louisiana high school signees featured below at one point. Whether it is watching full game film or seeing them in person, Brecheen has gotten the chance to see a lot of these signees play. In today’s college recruiting recap, Brecheen takes a dive in the Southern football program as he gives out his top four talented high school signees, top transfers, sleeper players to keep an eye on, and also, his final thoughts on the entire signing class in general! Bio: Quietly, over the last couple of seasons, Travien Benjamin flew under the radar as one of the best running backs in Louisiana. Benjamin played a major role in leading the team to its best season since 2005 with a 12-1 record. Wherever the St. Martinville offense had gone, that is where Benjamin went as he was the team’s bell cow with over 4,000 yards and 55 touchdowns in his prep career. The All-State running back may be only 5-9, but his blend of vision and power makes him a big time steal for the Jaguars. Before signing with the Jaguars, other colleges such as Houston, Navy, Nicholls State, Tulsa, and Tulane were all pursuing him in the end. 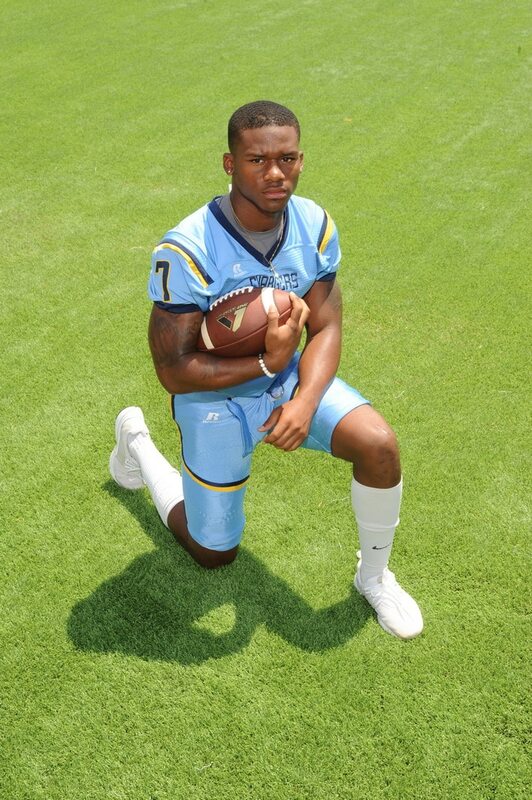 Bio: In speaking of big time pickups, the Southern Jaguars struck the gold mine again with signing Bertrand Carrell out of Madison Prep Academy. Considering that Carrell had other offers from Jackson State, Arizona, Tulane, South Alabama, Idaho, Kentucky, Southern Miss, Texas A&M, Missouri, Arkansas State, Alabama State, ULL, Southeastern, Colorado State, and Memphis, it is impressive that he decided to sign with the Jaguars. It is even more impressive that even LSU was even close to offering the three star safety. 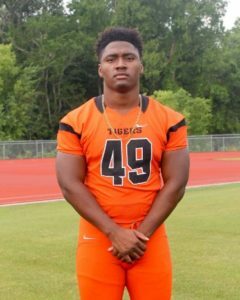 During his prep career, the Louisiana Football Magazine 2nd Team All-Louisiana preseason selection was involved with participating in track and field events for his school at the conclusion of football season. Bio: In the state of Louisiana, you won’t find as many raw and athletic gifted players like Jaylon Ned. At 6-6, 240 pounds, Ned comes from a basketball background and only with just a few seasons playing football, he has shown what he is capable of doing. After being offered by schools such as Jackson State University, Grambling State University, Houston, Tulane, ULM, ULL, Northwestern State, Nicholls State, Prairie View A&M, and others, it really came down to two schools one being Southeastern and the other being Southern. At one point, Ned even committed to the Lions of Southeastern, but after reflecting on it more, decommitted and committed to the Jaguars. 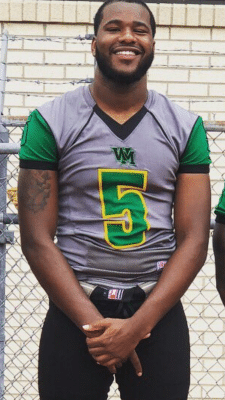 A big reason for his commitment and eventual signing was wanting to be a part of a team that competes for SWAC championships and maybe one day becoming an All-SWAC performer. As talented as he is, the sky is only the limit. 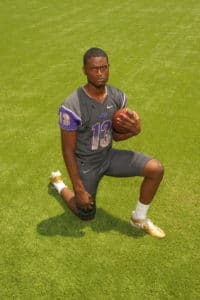 Bio: Just like Edna Karr High School, Warren Easton High School has also become a high school known for producing a lot of great athletes in the New Orleans area and Kiaeem Green is no exception. At 6-3, 185 pounds, Green’s frame and athleticism drew the attention of many colleges. At one point, Green committed to play for the Louisiana Tech Bulldogs before decommiting and then re committing as well as ultimately signing with the Jaguars. Green may have not a lot of catches during his prep career, but he took advantage every time he did get a reception. Out of his 26 receptions in a three year span, nine of those catches went for touchdowns, and also, he averaged over 17 yards a catch. Green was one of the seniors to lead the Eagles back to a Class 4A state championship appearance in the Superdome where they fell to the Cougars of Edna Karr. Bio: The Southern Jaguars have not only been racking up in the high school ranks, but in the college transfer ranks as well with their pickup of former Opelousas High and Georgia State defensive end Marlon Young. 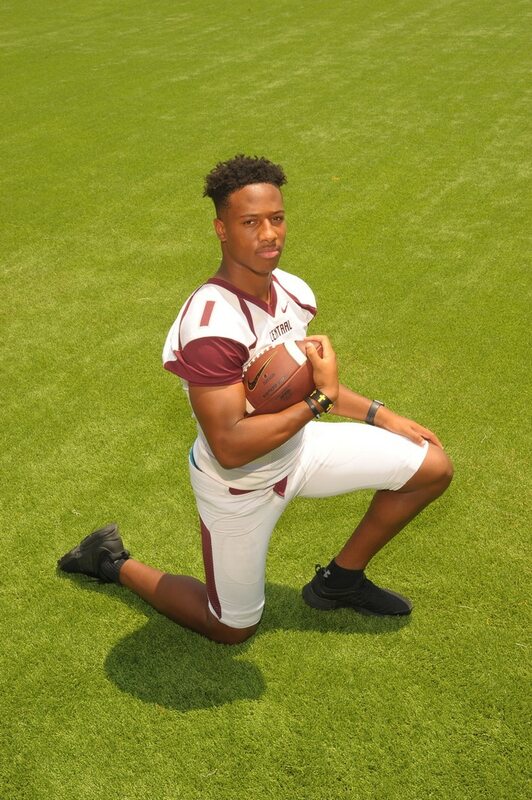 During his high school career at Opelousas High School, Young turned heads as early as his freshman year in high school starting the whole season. From there, he became a two time 1st Team All-District, 1st Team All-Parish, and an All-State selection. Young was also praised by Brecheen when he was named to the 1st All-South Louisiana preseason team and also making the front cover of the South Louisiana preview magazine edition back in 2017. From there, Young signed with the Georgia State. After only a year with the Panthers, Young decided to back to his home state and transfer to Southern University. Bio: Even though Anthony Shaffer spent his final year of high school at Central High School, he missed the entire 2018 season. Fortunately, the Southern Lab transfer did more than enough with the Kittens in order to get his name out there to colleges. In fact, before signing with the Jaguars, Shaffer had offers from Idaho, Jackson State, Jacksonville State, SMU, ULM, and South Alabama. Shaffer is a versatile defensive back. At 6-0, 200 pounds, Shaffer has the versatility to play in the back end of a defense to play the pass as well as play in the box to defend the run. He along with Carrell can potentially make up a great defensive backfield for the Jaguars. Bio: Like Marlon Young, T.J. Bedford is another talented college transfer that originally played his high school football in Louisiana, transferred to an out of state DI program, and transferred back in state to Southern. The former St. Paul’s High School product really broke out in his senior year with 63 receptions for 893 yards and 12 touchdowns while receiving 1st Team All-State honors. His big senior year drew the attention of colleges such as Texas State, Northwestern State, Southeastern, and Nicholls State ultimately choosing Texas State in the end. After two years with the program, Bedford transferred back to his home state to play for Southern. 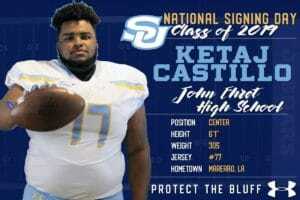 Bio: Ketaj Castillo was part of one of the biggest offensive lines in the state at John Ehret High School. Being the anchor of the offensive line, Castillo helped lead the Patriots to a Class 5A semifinal appearance last season. Castillo did get some attention from other schools such as an offer from Jackson State, but decided to sign with the Jaguars in the end.